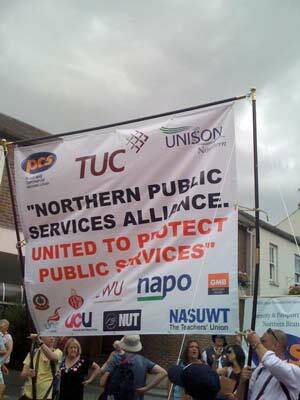 In the North East the Public Services Alliance (PSA) is the main coalition for opposing the cuts. It got off to a very impressive start, with a 150-strong public forum just after the emergency budget in June, followed by a series of well-attended local meetings to begin planning community-based campaigns. There was also a PSA contingent at July’s Durham Miners’ Gala (right). The second round of meetings, which aim to move things on practically, are now organised. The full details are below.